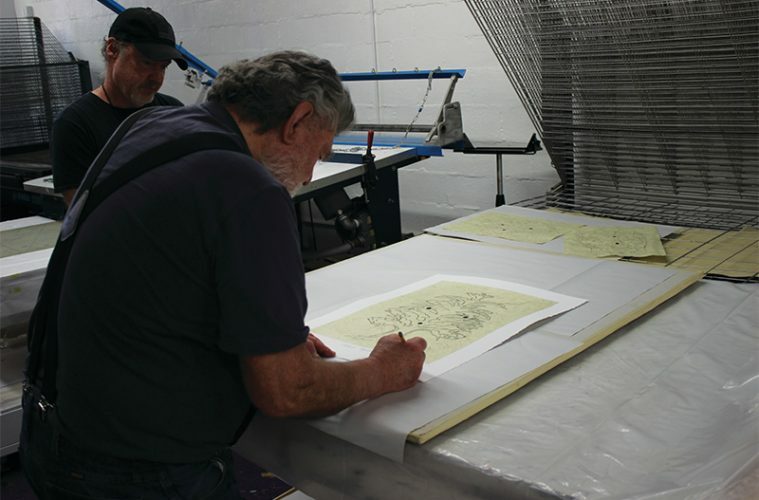 James Surls at Burning Bones Press in Houston, Texas, signing one of his prints from The Houston Suite, with Burning Bones Press printmaster, Pat Masterson. Photo by Ken General. As May arrives, General is busy with planning and organizing Houston’s print biennial, PrintHouston, on view at sites around the city through June. The festival is a way to encourage new audiences to engage with printmaking through exhibitions and events, and to collect prints. It also offers workshops and chances for printmakers from across Texas and beyond to mingle. 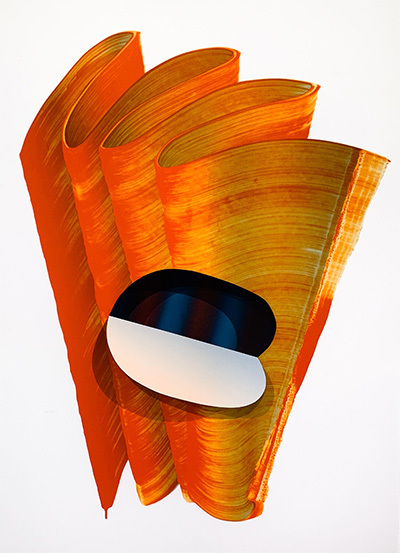 Jeffrey Dell’s exhibit, Maquette Moon, at Galveston Art Center is one of many Printmaking shows happening as part of Print Houston. Pictured: Jeffrey Dell, The Mote in God’s Eye, 2019, Screenprint, 34×22.” Photo courtesy of the artist. Founded ten years ago by a group of artists, PrintMatters encourages community support of the medium. “We decided we needed to take it upon ourselves to grow the community,” General says. He began working with the organization in 2011, invited by co-founders Cathie Kayser and Andis Applewhite. He eventually joined the board and, when his term was up, was invited to become executive director of the organization. Begun as an annual festival, PrintHouston recently shifted to a biennial model so it could take alternate years to plan and grow the event. For each edition, the organization invites local galleries and museums to participate with print-related exhibitions and programming, teaching new audiences about the medium. This year, about 15 spaces will be included. PrintHouston kicks off with a solo exhibition of prints at the Glassell School of Art on May 10th by featured artist James Surls. Texas-born Surls is a sculptor, printmaker, and poet with a long exhibition history; this year, he is the biennial’s featured artist. 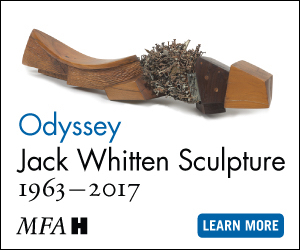 His exhibition The Houston Suite will be on view May 3-20, and he’ll deliver a keynote speech on May 12. 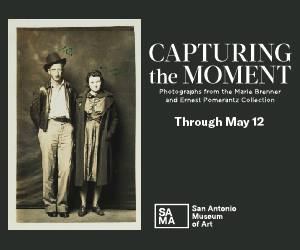 Alongside the exhibition, Surls will also lead a public print demo at the Glassell School of Art at the Museum of Fine Arts Houston on May 12. It’s a rare chance to see the process of an artist making his work, up close and personal and is not to be missed, General notes. Among the highlights for its 2019 edition, PrintHouston will also include a national exhibition juried by McNay Museum Curator of Prints and Drawings Lyle Williams. The exhibition usually draws hundreds of submissions from across the country. This year, it will be held at Sabine Street Studios at the Sawyer Yards in May. Leamon Green, On Upward, 2019, screenprint on paper, 9 x 12 inches. Courtesy the artist. Green’s print will be on view as part of the international group show The Americas Las Americas at Cindy Liscia Gallery. This is also the first year the organization has hosted a public installation. In a collaboration with Mystic Lyon, an installation space in Houston’s Fifth Ward, artists will install works in the public space, inviting visitors to interact with prints outdoors, ask the artists questions, and get involved, General says. The organization also tries to create international exhibitions for each edition. 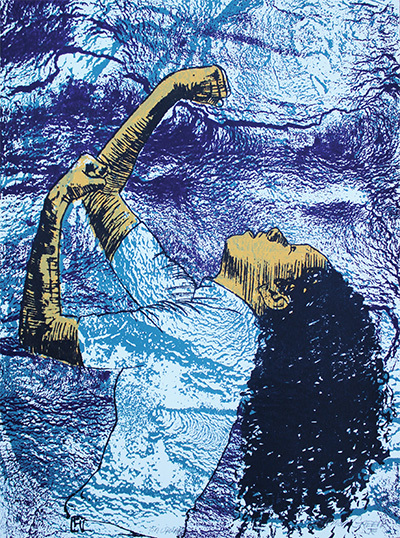 This year, they are partnering with La Estampa, a print organization from Medellín, Colombia, for a portfolio exchange. Fifteen artists from Medellín will send an edition of prints to be shown alongside 15 artists from Texas. Each artist will send 30 prints to create a portfolio that each participating artist will receive: every artist, then, will have a collection of the prints shown in the exhibition, on view at Cindy Lisica Gallery. The exhibition will travel next year to Colombia.